The effective reporting of randomised controlled trials has received useful attention in recent years. Many journals now require that reports conform to the guidelines in the Consolidated Standards of Reporting Trials (CONSORT) statement, first published in 19961 and revised in 2001.2 The statement includes a checklist of items that should be included in the trial report. These items are evidence based whenever possible and are regularly reviewed.3 The statement also recommends including a flow diagram to show the flow of participants from group assignment through to the final analysis. Compared with individually randomised trials, cluster randomised trials are more complex to design, require more participants to obtain equivalent statistical power, and require more complex analysis. The methodological issues in cluster randomised trials have been widely discussed.7 9 In brief, observations on individuals in the same cluster tend to be correlated (non-independent), and so the effective sample size is less than the total number of individual participants. The conduct of cluster randomised controlled trials may also differ from that of trials that randomise individuals. For instance, clusters are usually randomised all at once (or in batches) rather than one at a time. After randomisation, individuals in the clusters may be approached for consent, which raises the possibility of post-randomisation selection bias,4 or they may not, which raises ethical concerns.13 14 An expanded explanation of the methods of cluster randomised trials is available on the CONSORT website (www.consort_statement.org). The flow of both clusters and individuals through the trial, from assignment to analysis. Table 1 shows the modified checklist with the additions to the standard CONSORT list in italics. In this section, we discuss the rationale for these extensions and provide examples of good reporting. In some examples we have added text in square brackets to explain the context. Item 1: How participants were allocated to interventions (eg random allocation, randomised, or randomly assigned), specifying that allocation was based on clusters. The primary reason for identifying the design in the title or abstract is to ensure appropriate indexing of the study as a cluster randomised trial in Medline. This indexing ensures ease of identification of these studies for inclusion in systematic reviews. In addition, readers will not be misled by apparently large sample sizes. Researchers should also consider reporting the number of clusters in the abstract. Item 2: Scientific background and explanation of rationale, including the rationale for using a cluster design. The main difference when reporting a cluster trial, as opposed to an individually randomised trial, is that there are two levels of inference rather than one: the cluster level and the individual level.24 Thus, to allow readers to interpret the results appropriately, it is important to indicate explicitly the level at which the interventions were targeted, the hypotheses were generated, the outcomes were measured, and randomisation was done. Item 3: Eligibility criteria for participants and clusters and the settings and locations where the data were collected. Because there are two levels of inference, the eligibility criteria for clusters, as well as participants, need to be reported. In a cluster trial, the primary eligibility criterion is often all the clusters in a defined geographical area. Item 4: Precise details of the interventions intended for each group, whether they pertain to the individual level, the cluster level, or both, and how and when they were actually administered. Again, if the intervention was targeted at the cluster level, specific details of how it was administered should be described. Item 5: Specific objectives and hypotheses, and whether they pertain to the individual level, the cluster level, or both. Descriptions of specific objectives and hypotheses need to make it clear whether they pertain to the individual level, the cluster level, or both. Knowing the level of inference will subsequently aid interpretation of the statistical methods. Item 6: Report clearly defined primary and secondary outcome measures, whether they pertain to the individual level, the cluster level, or both, and, when applicable, any methods used to enhance the quality of measurements (eg multiple observations, training of assessors). Whether an intervention is evaluated at the cluster level or the participant level has implications for the appropriate analysis of the outcome data. It is therefore important that the level at which outcomes are measured be explicit in the trial report. Item 7: How total sample size was determined (including method of calculation, number of clusters, cluster size, a coefficient of intracluster correlation (ICC or k), and an indication of its uncertainty) and, when applicable, explanation of any interim analyses and stopping rules. A principal difference between a cluster randomised trial and an individually randomised trial is the calculation of the sample size. As indicated above, to retain equivalent power to an individually randomised trial, the number of individuals in a cluster randomised trial needs to be increased. The key determinants of the increase required are the intracluster correlation and the cluster size. Reports of cluster randomised trials should state the assumptions used when calculating the number of clusters and the cluster sample size. Item 8: Method used to generate the random allocation sequence, including details of any restriction (eg blocking, stratification, matching). Cluster randomised trials may use a simple, completely randomised design; a matched cluster design; or a stratified design. In individually randomised trials random assignment generally ensures that any baseline differences in group characteristics are the result of chance rather than some systematic bias.31 This cannot be assumed, however, for the cluster randomised trial. Although the assumption holds for cluster specific characteristics (that is, characteristics of the randomly allocated clusters), the researcher has little control over the individuals within each cluster7 and the number of clusters is usually relatively small. As a result, some form of constraint (matching or stratification) is often imposed on randomisation in a cluster randomised design in an attempt to minimise imbalance across treatment groups. Any constraint imposed on the cluster randomised trial affects the sample size and the analysis and thus should be reported. Item 9: Method used to implement the random allocation sequence, specifying that allocation was based on clusters rather than individuals and clarifying whether the sequence was concealed until interventions were assigned. In individually randomised trials, adequate concealment of the treatment allocation is crucial to minimising potential bias. If the person recruiting participants has foreknowledge of the allocation, bias can result.32 In a cluster randomised trial, allocation of treatment is predetermined for each member of the cluster. Hence the potential for selection bias (selective inclusion of patients into the trial) within clusters is particularly high.4 5 It is, therefore, particularly important that authors outline any strategies that were implemented to minimise the possibility of selection bias—for example, whether all patients within a cluster were included, or, if not, whether recruitment of patients was by a person masked to the cluster allocation. Item 12: Statistical methods used to compare groups for primary outcome(s) indicating how clustering was taken into account; methods for additional analyses, such as subgroup analyses and adjusted analyses. Identification of the level of inference allows readers to evaluate the methods of analysis. 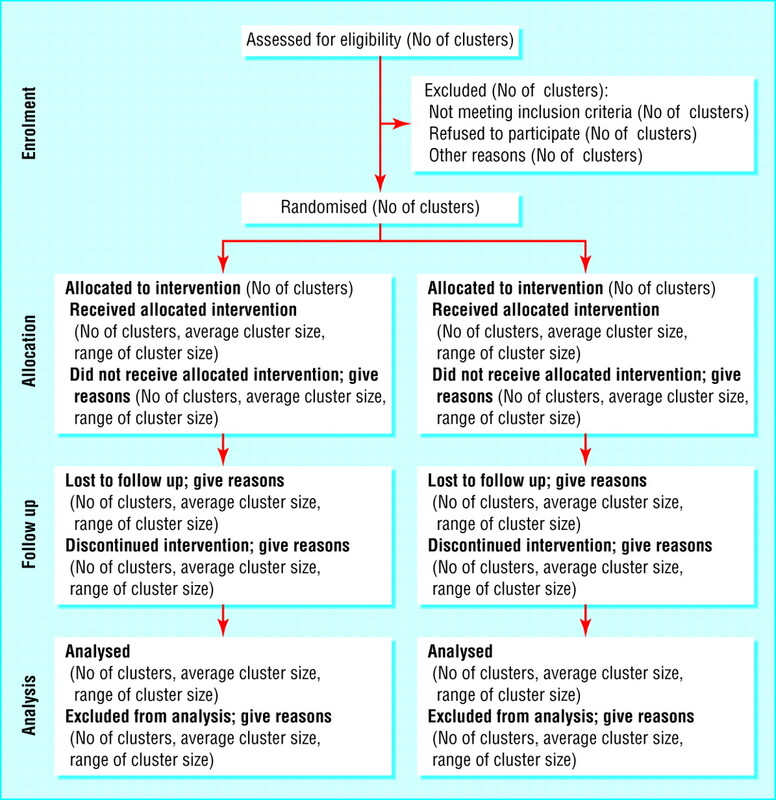 For example, if the intervention was targeted at the cluster level (at general practitioners rather than patients, for example) and outcomes were aggregated at the cluster level, sophisticated cluster adjusted analyses are not needed (as in the first example above). If outcomes were measured at the individual patient level, however, the analysis would need to adjust for potential clustering in the data (as in the second example above). Item 13: Flow of clusters and individual participants through each stage (a diagram is strongly recommended). Specifically, for each group report the numbers of clusters and participants randomly assigned, receiving intended treatment, completing the study protocol, and analysed for the primary outcome. Describe protocol deviations from study as planned, together with reasons. Knowing how many clusters and individuals did not receive the intervention as planned, the proportion dropping out, and the proportion for whom follow up data were not available is essential to interpret the study accurately. For example, individuals excluded after random assignment may not be representative of all participants in the study, and different drop-out rates may be directly related to the treatment received (if, say, one treatment has more severe side effects).33 The potential for differential adherence and follow up is exacerbated in the cluster randomised design because there are two levels at which drop-outs can occur: whole clusters or individuals in a cluster. It is therefore important to describe the flow of both clusters and individuals when reporting a cluster randomised trial. A flow diagram is usually the best way to present this information (see below). Item 15: Baseline information for each group for the individual and cluster levels as applicable. Random assignment by individual ensures that any differences in group characteristics at baseline are the result of chance rather than some systematic bias.32 This assumption does not hold, however, for cluster randomised trials. It is important to present summary baseline information for both clusters and individuals, most simply as tables of summary data. Item 16: Number of clusters and participants (denominator) in each group included in each analysis and whether the analysis was by intention to treat. State the results in absolute numbers when feasible (eg 10/20 not 50%). The number of participants who contribute to the analysis of a trial is essential to interpreting the results. Not all participants, however, may contribute to the analysis of each outcome. In a cluster trial, this fact is compounded by the possibility that not all clusters may contribute to a particular analysis. Because the sample size calculation, and hence the power of the study, is calculated on the assumption that all participants and (especially) all clusters will provide information, the number of participants and clusters contributing to a particular analysis should be reported so that any potential drop in statistical power can be assessed. The flow diagram can include this information if there is only one primary outcome; otherwise the numbers of participants and clusters contributing should be summarised for each outcome. Item 17: For each primary and secondary outcome, a summary of results for each group for the individual or cluster level as applicable, and the estimated effect size and its precision (eg 95% confidence interval) and a coefficient of intracluster correlation (ICC or k) for each primary outcome. Item 21: Generalisability (external validity) to individuals and/or clusters (as relevant) of the trial findings. In the discussion section of any trial report, the external validity of the results should be considered. External validity is more complicated for cluster randomised trials because the results may be generalisable to the clusters, to the individuals in those clusters, or to both, and thus the level at which external validity is addressed should be identified. We previously presented three options for modifying the CONSORT flow diagram for presenting clustered data: presenting the flow of data based only on clusters, only on individual participants, or both.8 Further experience suggests that the type of diagram should depend on the type of analysis because different approaches to analysis require information at different levels of the clustered design. For example, if the analysis is aggregated at the level of the cluster, the flow diagram should relate to the cluster level data (fig 1). To allow meaningful interpretation, a measure of the cluster size (and an indication of how variable cluster sizes are) also needs to be included in the diagram. If, however, the analysis is multilevel or hierarchical, the flow diagram should present data flow for both clusters and individual participants (fig 2). Although we recommend this diagram for communicating the flow of clusters and participants throughout the study, the exact form and content of the flow diagram should be varied to present the specific features of a trial. Reports of cluster trials should include key information on the design and analysis to allow readers to accurately interpret the results. This information is also particularly important for meta-analysts attempting to extract data from such reports.39 We therefore recommend that journal editors include our guidelines in their instructions to authors. Inadequate methodological reporting of trials has been shown to be associated with bias in the estimate of treatment effects.40 Use of the CONSORT statement for the reporting of two group parallel trials is associated with improved reporting quality.41 42 43 We believe that the routine use of this proposed extension to the CONSORT statement will result in similar improvements for cluster trials. The CONSORT group is also developing modified recommendations to help improve the quality of reporting of clinical trials of other designs, including equivalence trials, crossover trials and multi-arm trials. The most up to date versions of all CONSORT recommendations can be found at http://www.consort-statement.org/. We thank the members of the CONSORT Group, especially David Moher, Ken Schulz, Tom Lang, David Sackett, Peter G⊘tzsche, Matthias Egger, and John Ioannidis for helpful comments on earlier drafts. The Health Services Research Unit is funded by the Chief Scientist's Office of the Scottish Executive Health Department. DGA is supported by Cancer Research UK. The views expressed are not necessarily those of the funding bodies.
. Improving the quality of reporting of randomised controlled trials. The CONSORT statement. JAMA 1996; 276: 637–9.
. The CONSORT statement: revised recommendations for improving the quality of reports of parallel-group randomised trials. Lancet 2001; 357: 1191–4.
. The revised CONSORT statement for reporting randomised trials: explanation and elaboration. Ann Intern Med 2001; 134: 663–94.
. Evidence for risk of bias in cluster randomised trials: review of recent trials published in three general medical journals. BMJ 2003; 327: 785–9.
. Cluster-randomized trials. Palliat Med 2002; 26: 69–70.
. Experimental and quasi-experimental designs for evaluating guideline implementation strategies. Fam Pract 2000; 17: S11–8.
. Design and analysis of cluster randomization trials in health research. London: Arnold, 2000.
. Extending the CONSORT statement to cluster randomised trials: for discussion. Stat Med 2001; 20: 489–96.
. Methods for evaluating area-wide and organisation based interventions in health and health care: a systematic review. Health Technol Assess 1999; 3(5): iii-92.
. Simple sample size calculation for cluster-randomized trials. Int J Epidemiol 1999; 28: 319–26.
. Balancing the number and size of sites: an economic approach to the optimal design of cluster samples Control Clin Trials 2003; 24: 544–59.
. Advanced statistics: statistical methods for analyzing cluster and cluster-randomized data. Acad Emerg Med 2002; 9: 330–41.
. Are distinctive ethical principles required for cluster randomised trials? In: Campbell MJ, Donner A, Elbourne D, eds. Design and analysis of cluster randomized trials. Stat Med 2001; 20: 473–88.
. Ethical issues in the design and conduct of cluster randomised trials. BMJ 1999; 318: 1407–9.
. Accounting for cluster randomization: a review of primary prevention trials, 1990 through 1993. Am J Public Health 1995; 85: 1378–83.
. The unit of analysis error in studies about physicians' patient care behaviour. J Gen Intern Med 1992; 7: 623–9.
. A methodological review of non-therapeutic intervention trials employing cluster randomization, 1979–1989. Int J Epidemiol 1990; 19: 795–800.
. Room for improvement in the reporting of cluster randomised trials in behaviour change research. Control Clin Trials 2003; 24: 69–70S.
. Considering clustering: a methodological review of clinical decision support system studies. Proc AMIA Symp 2000: 146–50.
. Evaluation of cluster randomized controlled trials in sub-Saharan Africa. Am J Epidemiol 2003; 158: 921–6.
. Self help smoking cessation in pregnancy: cluster randomised controlled trial. BMJ 2002; 325: 1383–6.
. Randomised trial of educational visits to enhance use of systematic reviews in 25 obstetric units. BMJ 1998; 317: 1041–6.
. Recommendations guiding physicians in biomedical research involving human subjects. World Medical Association Declaration of Helsinki. JAMA 1997; 277: 925–6.
. Community-based health intervention trials: an overview of methodological issues. Epidemiol Rev 2002; 24: 72–9.
. Randomised controlled trial of patient centred care of diabetes in general practice: impact of current wellbeing and future disease risk. BMJ 1998; 317: 1202–8.
. Insecticide impregnated curtains to control domestic transmission of cutaneous leishmaniasis in Venezuela: cluster randomised trial. BMJ 2002; 325: 810–3.
. Cluster randomised trial to compare three methods of promoting secondary prevention of coronary heart disease in primary care. BMJ 2001; 322: 1338–42.
. Evaluation of computer based clinical decision support system and risk chart for management of hypertension in primary care: randomised controlled trial. BMJ 2000; 320: 686–90.
. 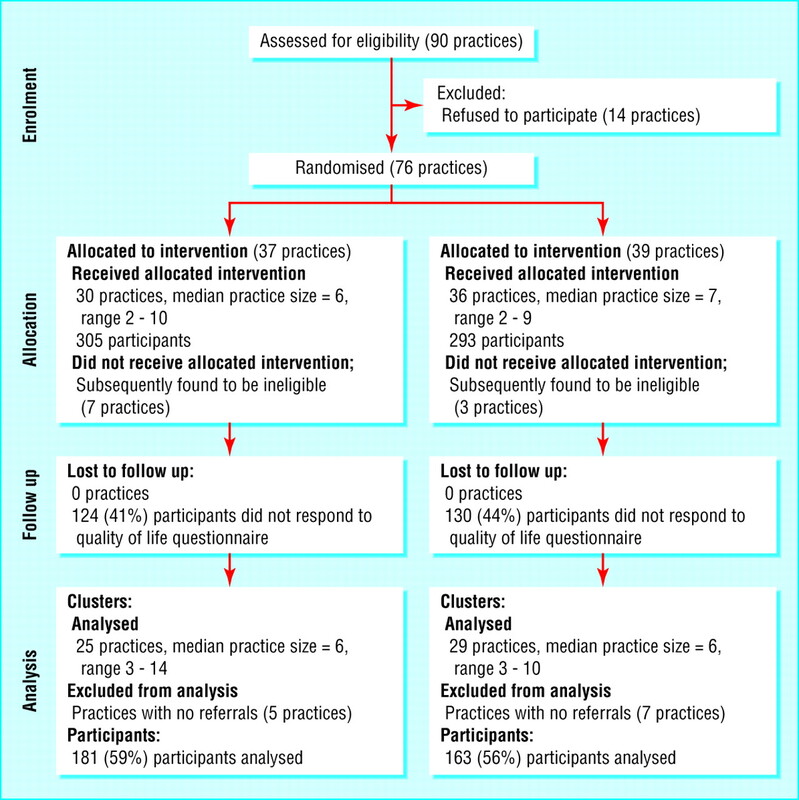 Cluster randomised trial of tailored interventions to improve the management of urinary tract infections in women and sore throat. BMJ 2002; 325: 367–72.
. Impact of improved treatment of sexually transmitted diseases on HIV infection in rural Tanzania: randomised controlled trial. Lancet 1995; 346: 530–6.
. Randomisation and baseline comparisons in clinical trials. Lancet 1990; 335: 149–53.
. Empirical evidence of bias: dimensions of methodological quality associated with estimates of treatment effects in controlled trials. JAMA 1995; 273: 408–12.
. Controversies in counting and attributing events in clinical trials. N Engl J Med 1979; 301: 1410–2.
. Effect of postal prompts to patients and general practitioners on the quality of primary care after a coronary event (POST): a randomised trial. BMJ 1999; 318: 1522–6.
. Sample size calculations for cluster randomised trials. J Health Serv Res Pol 2000; 5: 12–6.
. Intraclass correlation coefficients for cluster randomized trials in primary care: data from the MRC trial of the assessment and management of older people in the community. Control Clin Trials 2002; 23: 409–21.
. Design and analysis of studies evaluating smoking cessation interventions where effects vary between practices or practitioners. Fam Pract 1996; 13: 402–7.
. Cluster randomised trial of a guideline-based open access urological investigation service. Fam Pract (in press).
. A meta-analysis of smoking prevention programs after adjustment for errors in the unit of analysis. Health Educ Q 1996; 23: 48–64.
. Assessing the quality of controlled clinical trials. BMJ 2001; 323: 42–46.
. Use of the CONSORT statement and quality of reports of randomised trials: a comparative before-and-after evaluation. JAMA 2001; 285: 1992–5.
. Value of flow diagrams in reports of randomised controlled trials. JAMA 2001; 285: 1996–9.
. The reporting of methodological factors in randomized controlled trials and the association with a journal policy to promote adherence to the Consolidated Standards of Reporting Trials (CONSORT) checklist. Control Clin Trials 2002; 23: 380–8.